Referrals are your best friends. 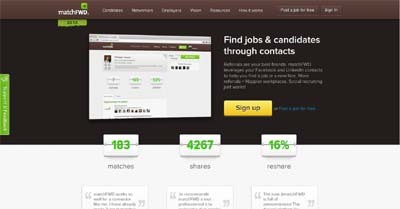 matchFWD leverages your Facebook and LinkedIn contacts to help you find a job or a new hire. More referrals = Happier workplaces. Social recruiting just works! We differentiate ourselves mainly on 3 points: Our deep focus on one main workflow (identifying best source of referrals within our users, their co-workers and their contacts networks to source qualified candidates, sharing the job and expanding the reach through targeted re-share), the combined power of multiple social networks (LinkedIn, Facebook and (very soon) Twitter) and a very compelling user experience for all types of users (whether they are hiring, connecting or looking for a job). We are also the only platform focused on helping “connectors” match who’s hiring and who’s available with suggestions while publicly building their reputation and taking care of the nitty gritty (follow ups, messaging, recommendations). Our performance based cost (only pay per referred applicants) is also a key differentiator.